After the launch of the Bizhub Pro 758 and 958, Konica Minolta is expanding its range of A3 color MFPs. Konica Minolta Business Solutions recently announced the upcoming release of three new A3 MFPs. These are the bizhub C658, C558 and C458 intended primarily for medium and large enterprises respectively and printing at speeds of 65, 55 and 45 ppm. "The C658 series enables users to operate our products as easily as they would a tablet," said Kevin Kern, Vice President of Business Intelligence Services and Product Planning Konica Minolta USA. "The enhanced 10.1-inch control panel offers increased functionality, including mobile near field communication (NFC) making it simple to connect the units to your Android smartphone or tablet. In addition, IOS support is available with the utilization of Bluetooth Low Energy (BLE) among many other mobile technologies. Plus, with fast dual scan speeds and large paper capacity, the new series increases the digital workflow automation capability in any business environment." This interface is similar to that found on the C368 series, which found favor in the DataMaster Tests, gaining the machines the full 5 stars - an exceptional result from DataMaster Labs. Of course, other mobile features have been developed by the manufacturer, such as compatibility with Mopria, AirPrint and Google Cloud Print. Also, these MFPs feature a maximum paper capacity of 6650 sheets of a 250 GB hard drive as standard - and they can be equipped with a Fiery IC-416 controller as an additional option too. There is also a wide range of finishing options. Booklet creation modules, hole punching, stapling and folding (including one offering a z fold) are all available. 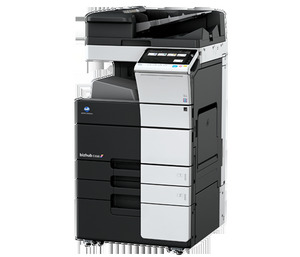 "With these new multi-function printers, Konica Minolta offers offices a way to become more productive. Users have a device that is easy to operate and saves time and effort. Ultimately, the bizhub C458, bizhub C558 and bizhub C658 offer the perfect platform for collaboration, bring fluidity and security to document workflow and allow our customers to focus on their core business," added Julien Azzi, Product Manager at Konica Minolta Business Solutions Europe . Finally, the series also meets the environmental standards, and the machines in the range are all certified Energy Star, Blue Angel and EPEAT. The bizhub C558 is already available on the European market. The C658 and C458 will follow in September.